A fire that caused severe damage to a farmhouse in Cheriton is thought to have been caused by rodents chewing through cables. 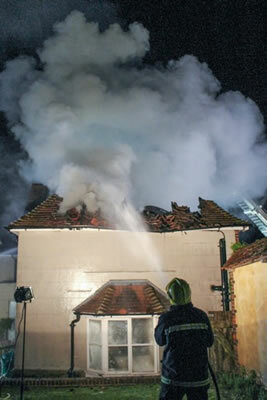 50 firefighters were called to North End Lane in Cheriton on Sunday night. They found the origin of the fire was most likely to have been electrical cabling in the roof, which had seen its PVC insulation chewed off by rodents. "The firefighters worked extremely hard to stop the fire spreading to the rest of the roof and also salvaged much of the owner's property from the house. "The first crew on the scene put in place a really good plan, which ultimately saved much of the roof and top floor of the building." The owner of the farmhouse was in his property at the time the fire broke out and managed to evacuate, along with several members of his family. "The family did absolutely the right thing. In the event of a fire, we urge people to get out, stay out and call us out."